Every time I go to take a shower, it’s like a march to my own death. 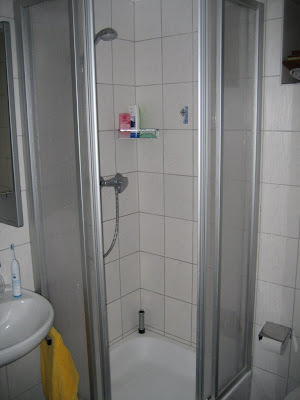 The shower here is a two foot square box with two small sliding doors in the corner which both slide together to close. I’ve never been claustrophobic before, but in that watery coffin, I often find myself looking at the walls, wondering if they are actually closing in on me or if it’s just my imagination. I raise my arms to wash my face and bash my wrist against the shower door, dropping the soap. I turn around and bend over to pick up the soap and smash my face against the tile wall. I come back up quickly and bonk the back of my head on the handle, making the water gush out hard on the beginning stages of the welt on my noggin and into my eyes. I turn again to get my face out of the hard stream of water, knock my elbow against the shower handle again, and this time get scalded by the now lava-hot liquid spraying out at me like an AK-47 pumping me full of lead. Then, just as suddenly and for no reason at all, the temperature shifts dramatically, and is now about as hot as Scott Baio’s career. While screaming and weeping, I manage to use enough water to rinse off any soap that actually made it onto my body during the harrowing affair, then leap out of my cage and violently towel myself off. I make it out alive, and spend the rest of the day and evening dreading my next visit to the torture chamber that is our shower.